John Lewis has partnered with EventBeat to showcase their Autumn/Winter 2016 collection and present the great things their customers are saying about them online. 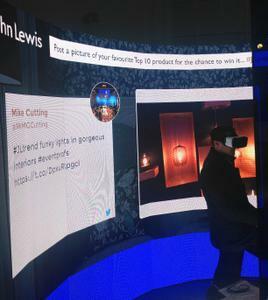 A trail led spectators through displays unveiling the latest trends and products in the John Lewis range. EventBeat was commissioned to power screens throughout the event, broadcasting advertisements and social media feeds to the guests as they meandered through the exhibition. Attendees were encouraged to tweet using the hashtag #JLtrend and share their favourite pieces on display. EventBeat managed the screen, moderating social content and creating a stream of interactive tweets. ​As the guests were predominantly members of the press a huge amount of people took to social media creating a wave of responses for our on-hand moderator to manage. We received over 140 tweets in a few hours! The interactive social media wall not only increased engagement with the participants of TREND but also generated anticipation for products with free customer led advertising.